Back on the market, better hurry before it is gone again! 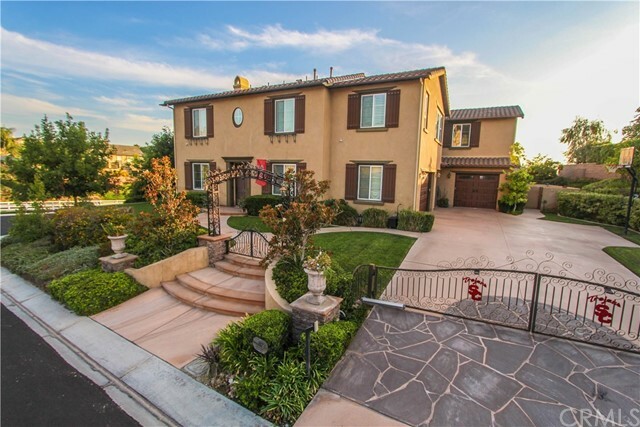 Stunning curb appeal and located in yorba lindaâ€™s most prestigious and desirable neighborhood - kerrigan ranch! Like a priceless rembrandt, your new home is painted against a backdrop of rolling hills and enjoys panoramic lighted views across orange county, to the glossy shimmer of the pacific, and catalina. This 6 bedroom, 5Â½ bath estate exudes luxury throughout. The private half acre lot has only 1 single story neighbor, offering the utmost in desirability. One bed and bath is located on the main level, along with an office, formal living and dining rooms, a music room or den, and the most amazing gourmet kitchen that lives up to â€œmaster chefâ€� standards. Take note of stunning custom crown and double crown molding. Upstairs, the master suite enjoys unobstructed views, dual huge walk-in closets, and a redesigned master bath that would rival a spa at any 5 star resort. Discover the bonus room, up the stairs, off the kitchen that currently accommodates a theater and game room. This home is perfect for entertaining. The breathtaking backyard is unbelievable. Salt water pool, spa, dual gazebos; one complete with tv and fireplace. The outdoor kitchen surpasses most homes indoor kitchen and even has its own wine refrigerator! Donâ€™t miss the new insulated garage doors complete with wifi app, electric gated driveway entry, video camera surveillance retrievable on you phone, and paid solar panels (bills of $600-800 per yr). For more information or make an appointment to see property ID PW18233809.